We went with our tour operator whilst on holiday at Hotel El Paso and it cost us £169 for a family of four. It was about an hour from Salou by bus and it was a pleasant journey, our guide knew so much about the ground and Barcelona and was entertaining to listen to so it went quickly. 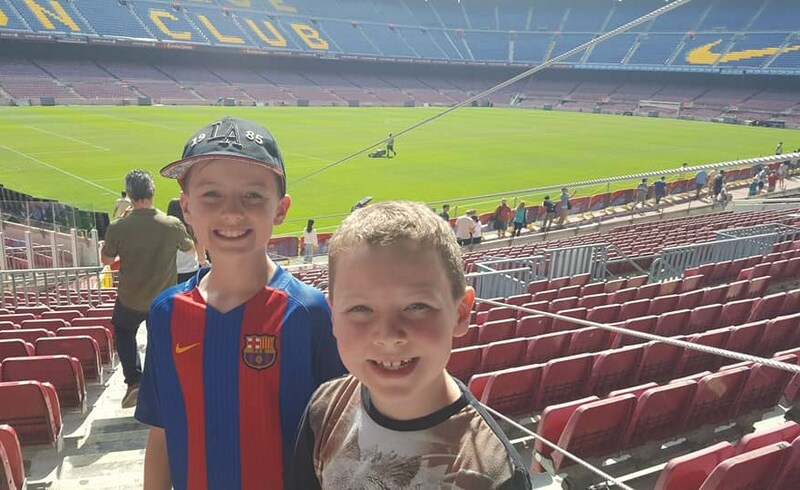 We were having the stadium tour (the price included entrance) and then a few hours free time in Barcelona itself. The Barcelona Football Ground is having series renovation work and there is lots planned. It will make it more accessible for people. 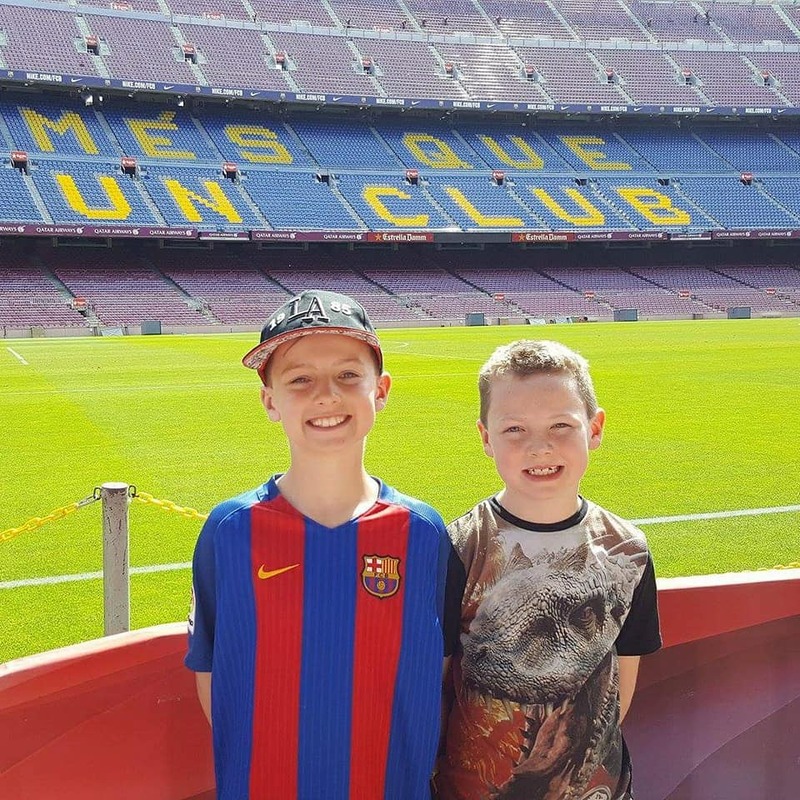 I am glad we went, as my eldest especially is a BIG Barcelona fan so he was thrilled to see behind the scenes. I am not really that bothered about football myself, I can take it or leave it, but it was magical seeing his face light up. It was quite busy, one of the very first rooms (the Trophy gallery) was packed, it was hard to see all the cabinets and I felt a bit claustrophobic, but afterward the FC Barcelona museum the crowds thinned for the reminder of the tour thankfully! 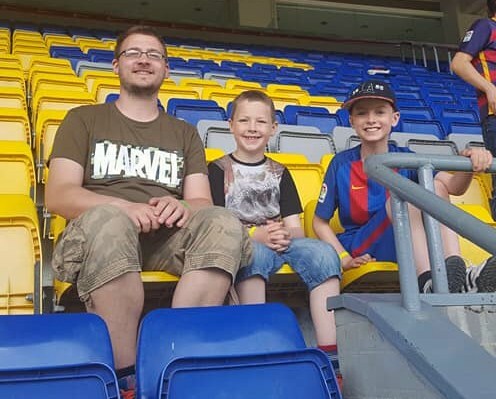 We were less interested in the museum I think and enjoyed the Camp Nou Tour more with the stands, field, pressroom, commentary boxes and seeing the away side changing room. But I am sure some people will really like seeing all the cups, photo’s and videos if you have enough time and patience to navigate the crowds!!! I loved the feeling looking at the pitch itself being high up in the stands knowing lots of great football had been played here to big crowds of people. You can just imagine the incredible atmosphere, its quite magical even for me who doesn’t really watch much football. We bought a photo of the boys holding the replica trophy that was quite expensive about 20 Euro’s, but I am pleased we have a keepsake of our visit. They were also selling bits of grass that Messi had played on which might be a fun novelty for friends back home, but I didn’t see the prices of them as it was quite busy as everyone was queuing for the lift – you can bypass the lift and go up the stairs but I am not sure how many people realised this.